Borghi d’Elsa takes its name from the picturesque villages that line the Elsa River: Monte Reggiani, Colle, San Gimignano and Certaldo. Terroir: This Chianti is sourced from select vineyard sites in the heart of Chianti along the south facing slopes of the Elsa river. The vineyards line the river on well-exposed hillsides that reach elevations of over 1,200 feet, with a blend of alberese, marl and limestone soils. 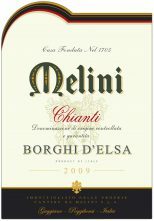 Vinification: The Borghi d’Elsa is vinified in a traditional Tuscan style; grapes are macerated for 10 days with frequent remontage (punching down of the cap) to bring out additional fruit and character. Aging takes place over a period of 6 months in a combination of large oak casks and neutral stainless steel tank.